Engineer Andrew Dockrell, left, conductor Dylan Paradis and Trainee Daniel Waldenberger-Bulmer, right, killed in the Canadian Pacific freight train derailment near Field, B.C. The freight train that derailed and killed all three crew members on a B.C. mountainside on Monday began rolling away on its own after making an emergency stop during which its brakes were adjusted at the top of a steep grade. Before it sped down the mountain near Field, B.C., and careened off a bridge into the Kicking Horse River, the train operated by Canadian Pacific Railway Ltd. underwent adjustments to the air brakes on several of its grain cars. This happened during an unscheduled two-hour halt on a downward-sloping sidetrack in the Rockies, said David Fulton, a general chairman of Teamsters Canada Rail Conference, the union representing CP train crews. 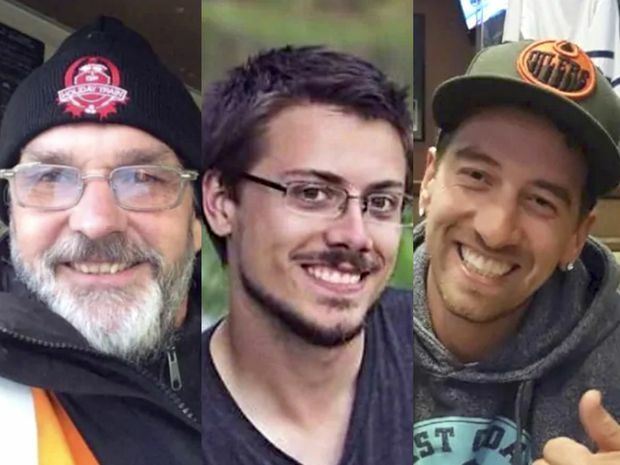 It is not clear why the train made an emergency stop, nor why it rolled away out of control and crashed, killing conductor Dylan Paradis, engineer Andrew Dockrell and trainee Daniel Waldenberger-Bulmer. “There is no explanation why they moved,” Mr. Fulton said. The crew of three had arrived at the train to relieve the original crew, which is believed to have worked its maximum shift. But that new crew had not been given permission by controllers to keep going toward Field, B.C., when the three locomotives and 112 cars filled with grain began moving downhill, James Carmichael, a Transportation Safety Board (TSB) investigator, told reporters on Tuesday during a news conference in Calgary. “The crew had just arrived and had boarded the train but were not yet ready to depart," he said. The train had stopped on a hill with all the air brakes set for two hours when the train began to move on its own. There were no hand brakes applied. “It was not anything the crew did; the train started to move on its own,” Mr. Carmichael said later. The train originated in Red Deer, Alta., and was headed to Vancouver. Hours before the derailment, the train had passed through Calgary on its way to the Rocky Mountains. The train derailment is shown near Field, B.C., on Feb. 4, 2019. After the train started to roll away on the sidetrack, it began to gather speed and was well in excess of the 32-kilometres-an-hour limit, according to the investigator. About 3.2 kilometres after the train began running downhill and out of control, it derailed and the lead locomotive plunged into the river, 60 metres below. Investigators have yet to find the black box in the first locomotive because of significant damage and have shifted their focus to finding a similar recording device in the locomotive in the middle of the train. CP TRAIN DERAILED NEAR FIELD, B.C. A team of investigators from the TSB is now looking at why the brakes failed, Mr. Carmichael said. It will be looking at regulatory issues, maintenance and the area where the accident occurred, which is considered one of the most challenging railroad territories in North America. The federal agency is also investigating whether cold weather, which was below minus 22 degrees Celsius on the day of the derailment, could have contributed to a failure of the air brakes. CP, which did not immediately respond to questions on Tuesday, said on Monday it will not speculate on the accident’s cause during the investigation. The TSB, an independent branch of the federal government, investigates incidents in rail, aviation, marine and pipeline industries. It can take about a year for it to publicly release a report. After the train began rolling away, the crew on board radioed to the dispatcher that they were gaining speed and out of control. Railroaders know the mountain route as Field Hill, a steep descent that includes one of the spiral tunnels built into the mountain more than 100 years ago. The route is infamous among railroaders for its difficulty – steep grades, tight turns and varying descents that require an experienced engine operator. Then there is the cold and snow, which render brakes less effective and make the rails slippery. CP prefers only engineers who have trained and worked on the route to drive through the area. It’s a route through which all kinds of freight is hauled – from crops to dangerous goods, such as ethylene glycol. For a mountain-going railroader, mastering the braking system is everything. Working the brakes to keep a two-mile-long train under control while monitoring the air-pressure gauge on the cab’s console is a hard-earned talent, veteran train operators say. In addition to hand brakes, a train has three brake systems: the dynamic, backward-force brakes applied to the engine’s wheels; the locomotive’s independent brakes; and the air brakes on each car, which are fed by a pipe pressured by the locomotive. Air brakes, also set in an emergency, are less effective in cold weather because the gaskets in the system shrink and let out air pressure. Ice and snow can reduce their effectiveness by working their way into the brake pads and wheels, and making the contact surfaces slippery. Locomotives at the head of long trains have more difficulty, especially during cold weather, supplying proper air pressure to rail cars farther down the line. For these reasons, railways run shorter trains in cold winters and place locomotives in the middle and end of the train to supply air to the brakes. The train that derailed on Monday consisted of 112 rail cars, an average length by today’s standards although longer and heavier than what was once the norm. In the name of efficiency, railways now run longer trains, often with fewer locomotives. The TSB has yet to pinpoint exactly when and why the brakes failed, according to Mr. Carmichael. “We have to look at the locomotive event records and determine what happened, as far as the brakes releasing and the train starting to move. We don’t know at this point when there was, for a lack of better term, a loss of control,” he said. He said 75 per cent of the rail cars in the Field derailment had adjustments made by hand to the retainer clips or valves, intended to partly set the brake. The valves can also be set in a manner that reduces the brakes’ effectiveness. The retainer clips are adjusted when something has gone wrong, said one former railroader who worked the area for decades and is not authorized to speak publicly on the matter. They are not changed routinely, nor simply to improve braking. The derailment outside of Field echoes the Lac-Mégantic disaster in 2013 when a freight train carrying 74 oil cars derailed in the small Quebec town. 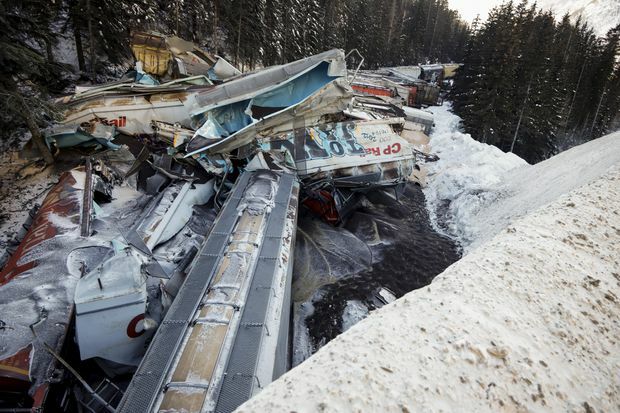 That train had been left parked overnight on a 1.2-per-cent grade pointed downhill toward the lakeside town, which was several kilometres away. Left unattended, the train rolled into the community when the air brakes holding it back failed. An insufficient number of hand brakes had been set by the one-man crew, a time-consuming process that requires turning an iron wheel on each rail car. The ensuing explosions and fires in downtown Lac-Mégantic killed 47 people in the worst rail disaster in modern Canadian history. In 2006, brake failure caused a Canadian National Railway Co. train to derail and slide down a mountainside near Lillooet, B.C., killing two crew members and injuring a third. Investigators said the train should have had an additional brake system, but it did not. Editor’s note: An earlier version of a graphic in this story listed elevation in thousands of metres. The correct scale is in metres.